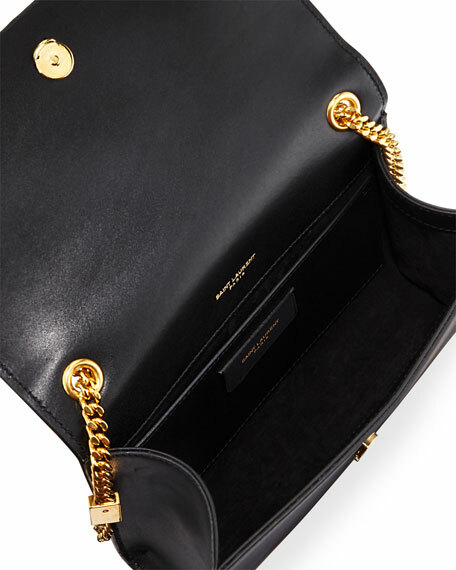 Saint Laurent "Monogram Kate" smooth leather leather shoulder bag. Chain shoulder strap loops through top, 21.8" drop. Flap top with logo medallion and chain tassel. Weighs 1 lb. 5 oz. MCM "Patricia" crossbody bag in colorblock leather and signature Visetos coated canvas. Removable/adjustable shoulder strap. Flap top with logo-engraved lock. MCM "Patricia" crossbody bag in colorblock leather and signature Visetos coated canvas. Removable/adjustable shoulder strap. Flap top with logo-engraved lock. Inside: two open compartments and one zip pocket. 7.5"H x 8.3"W x 3.2"D. Made in Italy. Paco Rabanne sleek calfskin crossbody bag with woven link trim. Removable flat top handle. 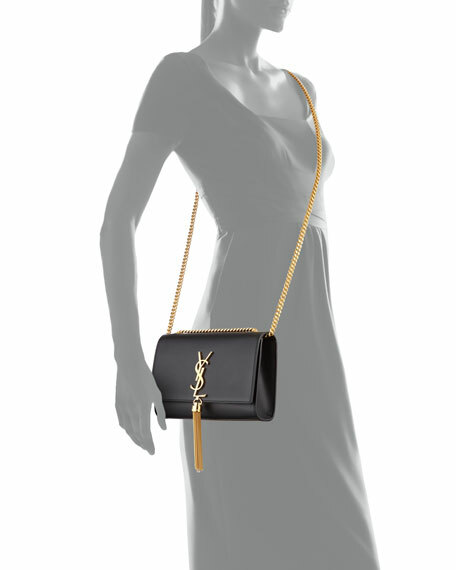 Removable link chain shoulder strap. Flap top with magnetic closure. Exterior, slip pocket at back. Made in Italy.